It's Sunday morning and that means it's time for another CAS Challenge at The Outlawz! This week it's a color challenge: Pink, White & Brown. I SO love these colors together. 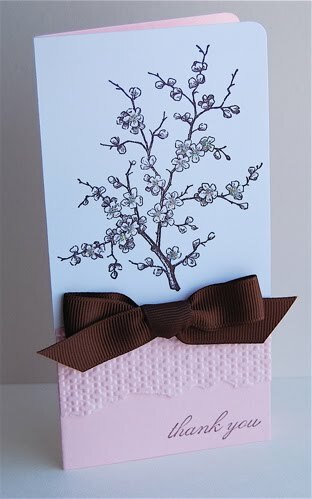 Using the large blossom image from Easter Blossoms, I was able to create a stand out thank you card, without a whole lot of fuss!! Although it's hard to see in this photo, I used the 2-way glue pen and Dazzling Diamonds to add just a little bit of sparkle to this beautiful card. I also went with a different sized card than the normal A2 size. I started with a 6 x 6 piece of Pretty Pink Cardstock and scored it at 3 inches, making the finished card 3 x 6 in. To order these or other Stampin' Up! Supplies, visit my Stampin' Up! Online Store. Wow this is stunning!!! Love love love it. Where can i find the outlawz challenge please? A simply beautiful card. Love the colors. TFS.